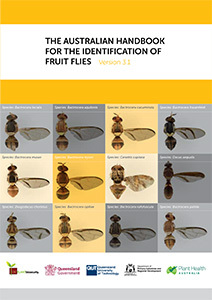 Version 3.1 of the Australian Handbook for the Identification of Fruit Flies has been comprehensively reviewed in consultation with, and with input from, fruit fly entomologists, scientists, academics and diagnosticians from Australia and overseas, including government departments of agriculture or primary industries and research institutions. The handbook and this website integrate all the techniques currently used in Australia for the identification of (primarily exotic) fruit fly species, using both taxonomy and molecular biology techniques. The handbook has been compiled by diagnosticians as a working handbook for diagnosticians.